Dr. Doom's mansion in Beverly Hills, California, U.S.A.
Powers/Abilities: Solarman's powers were derived from a combination of the Circlet of Power and direct sunlight. Solarman's strength was up to superhuman class 10 level, being able to smash through brick walls and Dr. Doom's Servo-Guards, had superhuman stamina, metahuman durability, although his agility and reflexes were about athlete levels. His height was about 6'6". Solarman could survive in space indefinitely, and was capable of sub-light flight speed with ease (although this was not instant). He was also capable of telemetry and instantly locating a point on Earth from outside the planet's atmosphere. The solar power of the Circlet was able to attract and repel the destructive beam of the Solar Ray. As Ben Tucker, he had the basic abilities of a human male teenager who avoided regular physical activity. Ben Tucker also had basic artistic skills and hoped to be a comic book artist at Marvel one day. The transformation from mere mortal to Solarman occurred with a bright flash and seemed to trigger an adrenal surge. Weakness: Solarman relied upon the power of the sun, and could not exist without it. History: (Solarman#1) - At home and still in his school uniform, Ben Tucker was drawing comic book characters when his father returned home. He immediately pretended to be doing exercising using a weight machine, as his fitness-focused father derided comics. He later saw Sha-Han's ship crash into the sea nearby. Investigating the crash, he found Sha-Han stagger ashore and rushed to his aid. Sha-Han passed the Circlet of Power to the teenager, and then died. Ben Tucker then met up with his father, who disbelieved his son's account. That night, in spirit form, Sha-Han met up with Ben Tucker and instructed him in the Circlet's power and the menace of Kraal. The next day, while on the way to school on his motor scooter, Ben Tucker was attacked by two of Kraal's killer robots, but was able to turn into Solarman. Utilizing his newfound abilities of flight and strength, he literally smashed the robots into pieces, before transforming back into Ben Tucker. This was just in time as Jenny and Denise appeared. Ben tried to explain what had happened, but the two girls did not believe him and left. Unfortunately for Ben, the two killer robots' modular structure allowed the robots to reassemble themselves, and they grabbed him from both arms before he could open the Circlet and transform again. The robots transported the boy back to Kraal's ship where Kraal demanded the Circlet from the boy. Ben was dragged away to be dismembered, but was rescued by Sha-Han's daughter, Altarra (accompanied by Beepie), who fired her pistols at the robots. Altarra, Ben and Beepie managed to escape under a sliding door, although Altarra was fatally wounded. Four of Kraal's tentacled robots next attacked, but Beepie opened a portal that let sunshine stream in, and Ben was able to once more transform into Solarman, easily defeating the constrictive robots. Spying Solarman, Kraal launched after him and attacked the solar hero, who sought to stop Kraal's attack on the Earth's sun. The two were evenly matched, until Solarman outwitted Kraal by getting the tyrant to bash a hull breach with his powerful cyborg arm. 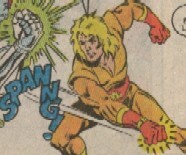 This caused a sudden blast that sent Kraal flying away, and Solarman was able to fly out into space. Using the Circlet, he halted the Solar Ray from destroying the sun, and instead returned the destructive beam to the Kraal's Star Cruiser, which began to break up. Solarman nimbly flew back and rescued Beepie before the ship exploded. (Solarman#1 - BTS) - Solarman returned to Earth with Beepie and transformed into Ben again, and integrated the mini-robot into his room's furniture. (Solarman#1) - In his room, Ben Tucker showed Jenny his latest comic strip, based on his adventure as Solarman, with Beepie sitting inert on his lap. (Solarman#2) - At Ben's house, Jenny told Ben of her concern about the ozone layer's depletion, but Ben was more focused on drawing Dr. Doom. Jenny left, as did Ben soon after, leaving Beepie to tidy the room, while he went to his father's gym for a workout and to drop off artwork for an advert. However, Ben saw his father be threatened by a group of three protection racket thugs, and the youth left quickly so that he could secretly turn into his Solarman identity. As Solarman, he flew into the gym and cheerfully announced himself as the new bouncer, before easily trouncing the thugs. Solarman then defended Ben Tucker verbally to Mike Tucker and flew off, before converting back to Ben. The teenager then tried to explain that he was really Solarman, but his father thought that he'd lost touch with reality because of comic books, with clouds preventing Ben from transforming that could've provided proof. Ben later overheard his father talk to a doctor, and he then decided not to tell anyone about his super-powered identity. Watching Dr. Doom's TV announcement with Jenny, Ben remarked that events paralleled the storyline he was drawing. 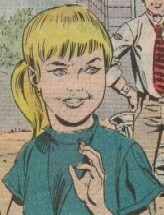 Jenny very soon left and Ben, suspecting that Dr. Doom was behind the ozone threat, then left on his motor scooter to Dr. Doom's Beverly Hills mansion. He was stopped at the gates by Dr. Doom's Servo-Guards, but his cover story of seeking to get an interview with Dr. Doom for his school magazine appealed to the vanity of the Dr. Doom hologram, and he was granted an audience. However, the hologram abruptly terminated the interview when he saw Ben noticing all the technical equipment, and ordered that the youth be thrown into a comfortable cell. Ben languished until he saw sunrays enter the room, and once more became Solarman. He smashed through the outer wall then launched into the sky to hunt for Dr. Doom's Satellite of Death, but was chased by three Servo-Guards on mini sky-sleds. He easily smashed the robots, but was unknowingly watched by every monitoring station on Earth. He then found Dr. Doom's satellite and its destructive green ray and, being unable to destroy it, turned the beam so that it blasted Dr. Doom's mansion, forcing the hologram to activate the satellite's self-destruct button. Solarman charged back to the Doom mansion and smashed through a wall. Distracted by two Servo-Guards, which he destroyed, Solarman was then blasted by Dr. Doom's disorienting ray, but this did not immobilize the solar hero as the Latverian lord had planned, although it did cause some level of pain. The hologram then activated around a dozen metal tentacles that wrapped around Solarman, but these were quickly torn asunder. Solarman pursued the hologram by crashing through an inside wall, then flew directly at the Dr. Doom hologram only to rebound from a force field that seemed to reflect his assault back at him; this threw Solarman through a brick wall. This was fortunate for Solarman as he saw that it was sunset, and his sun-based powers would soon be extinguished. Effectively at a stalemate, the two exchanged threats and parted company. Ben reconciled with his father by drawing his dad as Solarman. This pleased the older Tucker so much that he celebrated by taking his son down for a night-time workout at Tucker's Gym, much to Ben's chagrin. Comments: Created by Created by Stan Lee (script), Jim Mooney (penciler) & Dennis Janke (inker); original Solarman created by David Oliphant. 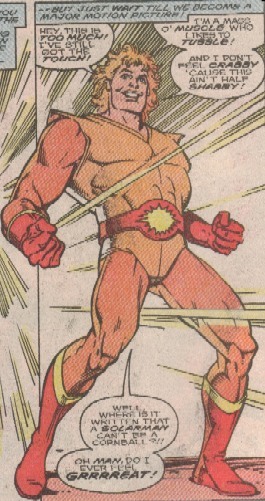 Solarman was dubbed "the Galaxy's Hottest New Hero" on the cover of Solarman#1, but by issue #2, this had been scaled back to "Earth's Hottest New Hero". Boyd Kirkland, who did layouts for Spider-Man and his Amazing Friends, Spider-Man & Hulk, also drew storyboards for the Solarman animated pilot. On 13 June 2004, he stated that "If I remember correctly, Stan Lee wrote it for another client who funded it (I can't remember who). The intention was to create a new series/toy franchise independent of the Marvel Universe. It never took off." The advert at the end of the comic shows what look to be drawings for the figurines (right). Indeed, this initial story suggests many marketing opportunities for figurines and spaceships. 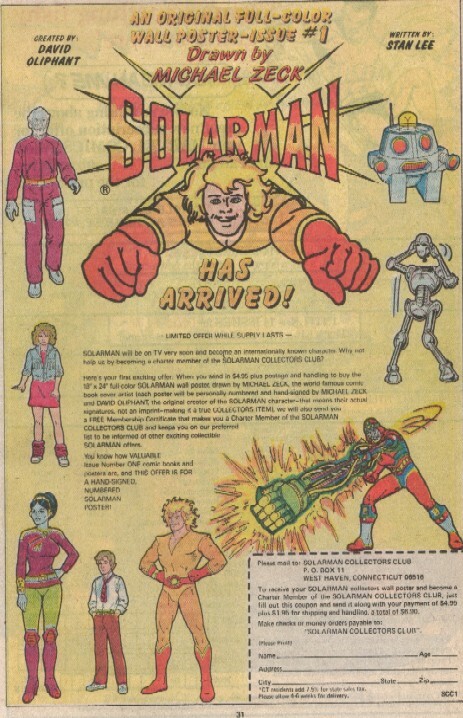 Interestingly, the only adverts in Solarman#1 (apart from the inside covers) was that for the Solarman Collectors Club (p31) and the subscription page on the other side, leaving 30 pages for continuous comic panels. A bit of a Marvel fanboy, Ben Tucker had several bits of Marvel merchandise, such as Spiderman, Silver Surfer, grey Hulk and green Hulk posters (although some of these may have been personal art pieces), green Hulk and standard and black Spiderman figurines, plus Captain America and Hulk drink cups that held his art pens, and wore a t-shirt with a Spiderman head on it, which he wore to Dr. Doom's mansion. Ben also did not wear any watch, so a watch-like golden bracelet on one wrist was not out of place. Sure, the plots are simplistic and have holes, but I've read worse. Ultimate Solarman anyone? Neal Adams is now reviving the character away from Marvel (see here). Kraal called the Circlet of Power, which was a golden bracelet extraterrestrial in origin that imbued the wearer with incredible solar-activated powers, as being indestructible. Kraal hid it away until it was stolen by Sha-Han in an effort to find a hero to oppose the destructive Kraal. 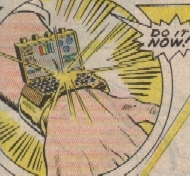 Sha-Han crashed on Earth and gave it to Ben Tucker, who wore it on his right wrist. In times of need, and given direct sunlight, Ben Tucker opened the Circlet to the sun's rays and transformed into Solarman. 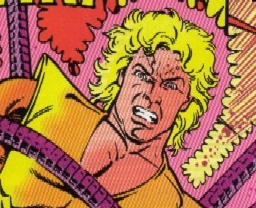 At one point, Kraal identified an Earthling as having Solarman powers, indicating that the Circlet seemed to generate an artificial adult body that kept the wearer's skin colour, but changed eye and hair colours, and which was capable of flight, limited invulnerability and super strength, as well as a bright costume and messy blonde hair. Once on Ben Tucker's wrist, the bracelet could not be removed. It is implied that Sha-Han created it, especially given that Beepie knew how the Circlet functioned, and it seemed linked to the Solar Ray he had created for Kraal. Jenny, accompanied by her school-friend Denise, encountered Ben Tucker outside their school, after he had transformed from Solarman. She was disbelieving when Ben explained to her that he had just busted up two robots. Ben later introduced her to an inert Beepie after he had defeated Kraal, but she again questioned his credibility. Jenny was concerned about the depletion of the ozone layer and Dr. Doom's threats, but admired Ben's artistic skills. She sometimes waited for Ben in his room and seemed to be a close friend of his. Often called Jen, she was about Ben Tucker's age, had blonde hair in a ponytail and blue eyes, but no other distinguishing features. Jenny is (mis)spelt Jennie in Solarman#2.